Hey friends! Guess what? We’re entering the fifth month of 2015. How did that happen? At this point, seeing as the year is nearly halfway over, I feel I should revisit my New Year’s goals and reflect on the progress I’ve made. How is 2015 going for you so far? Have you achieved any goals you set? If yes, go you. If not, it’s not too late to start! I look at the start of each new month (and each new day, really) as an opportunity to start fresh. Consider this a nudge to reset and get back on track. Before we jump into May, we first want to say thank you to everyone who participated in our recent survey! You were all so kind to give us your time and feedback. It’s so appreciated. We’re going to put your suggestions to good use as we continue to refine and improve Minimalist Baker moving forward. So thanks again! 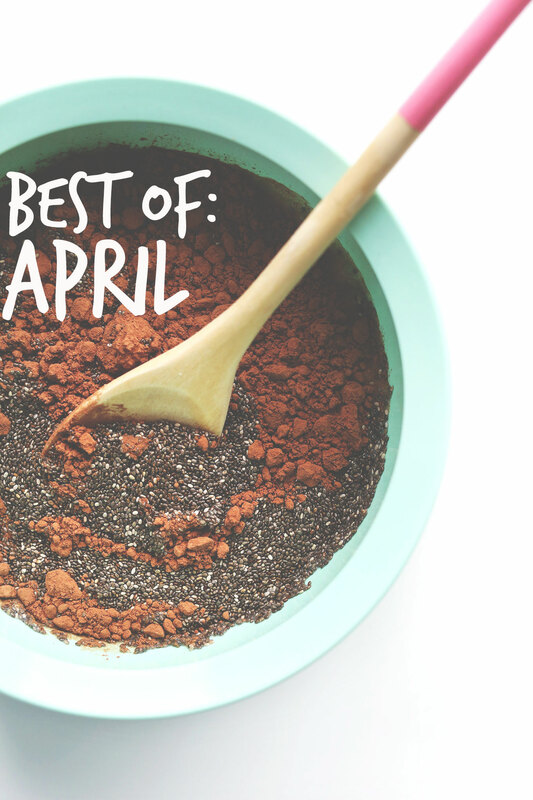 Now, let’s recap what we did, made and ate in April, as well as a few of our favorite things at the moment. Per usual, let’s kick it off with eats. What was your favorite recipe this month? I think mine was a tie between the Chocolate Hazelnut Cake and the Garlicky Kale Salad. So good! I rarely buy cookbooks, but I couldn’t resist this one from my longtime blog crush My New Roots. Let me tell you, it’s a beauty, and it’s already inspiring me to eat more seasonally! Definitely worth a peek. Longtime readers may know my obsession with the girls at Tone It Up. In an effort to simplify our schedules (and be mindful of our spending) I forgo a gym membership in favor of exercising outdoors and doing workouts in our apartment. The TIU girls just launched their 2015 Bikini Series and I’m already hooked. Start with this workout, do it twice, and your abs will thank me. This podcast on productivity from Fizzle was one of my absolute favorites in April. I found myself wanting to jot down notes on everything shared and then immediately put it to use. Such good, solid advice from two industry professionals on getting meaningful stuff done. After watching the entire first season of Unbreakable Kimmy Schmidt on Netflix (I give it 3.5 out of 5 stars – it grows on you), we have since resumed our ongoing obsession with Bob’s Burgers. Shout outs for any Tina fans out there (awkward teenage moan)? Also, show recommendations? We’re in the market for something new. Glancing ahead at my editorial calendar for May, it appears I have bananas on the brain. Go figure. Be prepared for some summer-appropriate recipes utilizing this nutritional powerhouse next month. Until then, cheers friends! You have to watch Broad City if you havent already!!!! It is hysterical and has me “lol-ing” all over the place! I loved your tandoori chickpeas (didnt make the whole salad YET) and the buddha bowl!!! Nice! Haven’t heard of it but I will! Rvery recipe you put up was a complete gen this month! Like usual…. And I agree about Kimmy Schmidt, I thought it was absolutely hilarious! I can’t wait for banananannarama. They are my absolute favourite ingredient! All of your recipes this month were incredible, Dana! Nice recommendations! We’ve already been all over How i Met, parks & rec and 30 rock. We actually just started Scrubs and are really liking it so far! I’ll have to check out your others faves. Happy May! 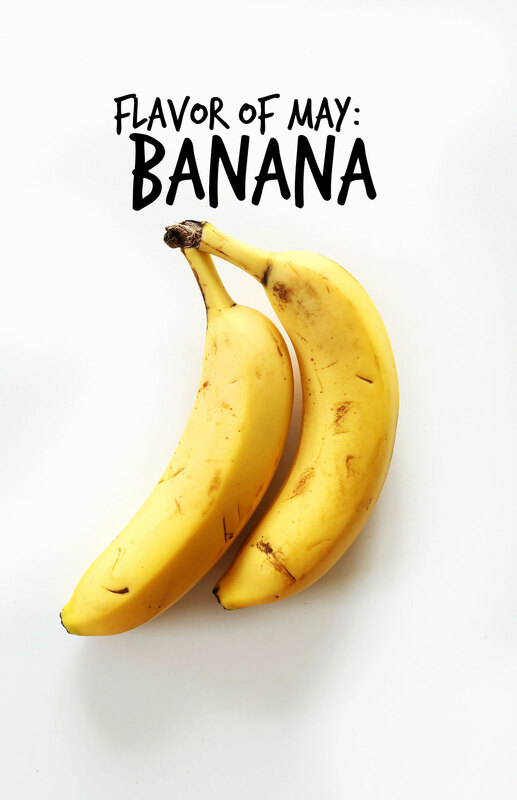 Well that’s good- because I am really craving banana right now!!!! I was hoping for some show recommendations, too. I never liked Kimmy’s show, though. Recent favorites have been Broadchurch, The Fall and Parts Unknown with Anthony Bourdain. Funny shows are hard. Kimmy is def one. Louie is the other. But crime/drama…so many! Happy Valley, Broadchurch, The Killing, Luther, The Fall. So dark though. And podcasts…do you listen to the Sporkful? I always enjoy that one. stunning photography as usual. and great recipes. will have to try one. and i hope you don’t mind me ‘borrowing’ the idea for a ‘best of april’ post. Put every post you have from April! They’re allllll the best! It’s older, but my husband are watching “The IT Crowd” and have cry-laughed more than once! Oh man, we’ve already devoured that show and LOVED it! Great tip! You definitely have created a bunch of amazing recipes this month. I’m looking forward to finally having more time for cooking/baking so that I can try a few of them. Austria, so cool! thanks, Kerstin! My favorite recipe this month was your Buddah Bowl. It’s on the top of my list to try. I’m a Tina fan too! But all the kids are so quotable. That’s the best show! What a great April! I’m pumped for what’s to come in May! Ah, thanks Sydney! So glad you’re a Tina fan, too. I was hoping I wasn’t alone in my adoration. Happy weekending! Agree on the productivity journaling fizzle episode. It’s a game changer to spend a few minutes at the end of the day reflecting and planning.